Sequential images of the moon show the change inflicted by a penumbral eclipse. 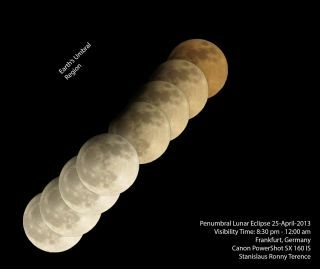 The images were taken April 25, 2013, by space enthusiast Stanislaus Ronny Terence of Chennai, India, during a trip to Frankfurt, Germany. 2018 features two lunar eclipses, one in January and the other in July. On Jan. 31, there was a spectactular Super Blue Blood Moon eclipse. The July 27 Blood Moon will be the longest total lunar eclipse of the 21st century. Both will be total lunar eclipses, when the full moon passes through Earth's shadow. Lunar eclipses are visible from anywhere on Earth where it is nighttime. However, the duration of the eclipse you see will depend on how close to moonrise or moonset the eclipse starts in your location. During total lunar eclipses, the moon turns a deep red color when it enters the depths of Earth's shadow. So why doesn't the moon just look like it's in darkness? The color change happens because Earth's atmosphere acts as both a lens and a scattering medium for the sun's light. This graph shows the path of the July 2018 total lunar eclipse, and times when the event will be visible. July's eclipse will be partially visible from the east coast of South America as the moon rises. For example, observers in Rio de Janeiro will see the moon already deep in the umbral shadow of Earth as it comes up at 5:27 p.m. local time. About 45 minutes later, at 6:13 p.m., the moon will touch the edge of the umbra and begin coming out. It will emerge from the umbra at 7:19 p.m., and the penumbral phase will end at 8:28 p.m. In Athens, Greece, the penumbral phase of the eclipse will already be underway at moonrise (9:24 p.m. local time), and the umbral phase will start at 10:30 p.m. The maximal eclipse will happens at 11:21 p.m., and the moon will move into the penumbra at 1:19 a.m. By 2:28 a.m., it will have exited the penumbral shadow completely. In Cape Town, South Africa, the penumbral eclipse will start at 7:14 p.m. local time, with the umbral phase following at 8:24 p.m. Maximal eclipse occurs at 10:21 p.m.; by that point, the moon will have looked red for about 40 minutes. The umbral phase ends at 11:13 p.m. This graph shows the path of the January 2018 total lunar eclipse, and times when the event will be visible. Update for Jan. 31: For full coverage of the Super Blue Blood Moon eclipse of 2018, visit our main guide here: Super Blue Blood Moon 2018: Complete Lunar Eclipse Coverage! On Jan. 31, the first lunar eclipse of the year will be visible from eastern Europe and eastern Africa, and from there eastward all the way to western South America. In Australia and eastern Asia, the eclipse will occur in late evening or near midnight local time, and this is where the moon will be highest in the sky. The year's next eclipse will be on the night of July 27, or the wee hours of July 28 depending on the time zone, and the center of the eclipse visibility region is on the Indian Ocean. The eclipse will be fully or partly visible in South America, Africa, central Asia and India, and parts of Australia. Viewers in New York City will have a chance to catch the January eclipse, but the July event will be below the horizon because it will be daytime in the U.S.
As you travel west, the eclipse starts earlier, so more of it will be visible before moonset. Chicagoans, for example, will see the moon touch the penumbra at 4:51 a.m. local time and the umbra at 5:48 a.m., with the moon turning the characteristic red at 6:51 a.m. However, at that point, the moon will be only about three moon diameters above the western horizon, so observers should be sure to find a viewing spot with a clear view. That can make for some dramatic photos as the moon sets at 7:03 a.m. In Hawaii, the moon will start turning red at 1:48 a.m. local time and completely enter the Earth's umbra and 2:51 a.m. Maximum eclipse occurs at 3:29 a.m. and the moon exits the umbra by 5:11 a.m.